"Token of Youth" and "Throw 'Til It Hurts!" Theme: "Wonder Tales of Science Fiction"
Extravaganza to feature Lionel Richie, Flo Rida and Chicago. All Hail Endymion! 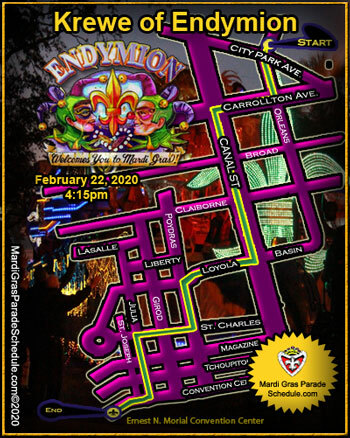 Mardi Gras Main Event, the Krewe of Endymion Parade, will roll on Saturday, March 2, 2019 on it's traditional Mid-City route. The theme this year is "Wonder Tales of Science Fiction" and will feature floats decorated will recall classic stories 20,000 Leagues Under the Sea to Gulliver's Travels to War of the Worlds and much more. The clubs newest, Club Endymion float is a tribute to the Mercedes Benz Superdome. The ETV float beams live crowd shots on a gigantic 20’ x 9’ LED screen. And the Pontchartrain Beach float, "Then and Now" is the largest float in Mardi Gras at over 300 feet long with over 250 riders and nine sections..
Endymion is the only parade that rides to and through the Mercedes Benz Superdome where the Endymion Extravaganza is held. After the gigantic floats, Endymion continues the tradition of providing the finest entertainment in Mardi Gras. Past performers have included Steven Tyler, Pitbull, Luke Bryan, Carrie Underwood, Kelly Clarkson, Maroon 5 and many, many others! Eleven regional and national bands entertain 20,000+ until 3:30 am. Founded in 1967 and named for the Olympian God of Fertility and Eternal Youth, this Krewe is the largest in Mardi Gras history, rising to "Super Krewe" status in 1974. Billing itself as "the largest non-military parade in the world," it annually selects celebrity Grand Marshals who also preside over the Endymion Extravaganza held in the Louisiana SuperDome immediately following the Parade. The motto of this Krew is: "Token of Youth" and its members also boast the phrase: "Throw 'Til It Hurts!" A list of more than 50 stars that Endymion has imported for its Extravaganzas reads like a show-biz Who's Who, yet the krewe has always included local talent in its entertainment. As the city's number one cheerleader, if there is ever a way to stretch a Crescent City component into a parade theme, float title, or maid's costume, Endymion does it. Even its fleur de lis logo is pure New Orleans! With the largest floats ever assembled, and parade themes with which everyone identified, Endymion quickly became the people's parade. The krewe also changed the look of Carnival, making an instant impact with its magnificent court costumes and enormous headdresses. The concept of showcasing the krewe's royalty and court within a parade was novel. People actually came to see Endymion's "pre-parade" of mini-floats, just to catch a glimpse of the visual spectacle. Who was Endymion? In Greek mythology, he was the most handsome of men, the god of eternal youth and fertility. Some versions describe him as king, others as a shepherd. The moon goddess Selene was so smitten with Endymion's beauty that she put him into a perpetual sleep so that she could kiss him whenever she wished. In literature, Endymion has been the subject of some on the world's most noted authors. In 1593, Thomas Drayton wrote "Endymion and Phoebe." John Keats composed, in 1818, an allegory entitled "Endymion". Oscar Wilde, in a poem, refers to John Keats himself as Endymion. The Elizabethan playwright, John Lyly, penned a play entitled "Endymion, the Man in the Moone." Benjamin Disraeli, in a political novel, named his hero Endymion Farras. He dreamed . . . The area near the Fairgrounds Race Course in Gentilly, which would serve as Endymion's spawning ground, was a special one for Ed Muniz. He grew up in the shadows of the Track. When he married, he located his family in the neighborhood. Ed's parents' home at 2816 D'Abadie Street would serve as headquarters and distribution center for his Gentilly Carnival Club (the charter name for the Krewe of Endymion). And in addition, Ed Muniz would one day own a radio station housed a few dozen feet from the Race Track. The ladies' Krewe of Adonis occupied the Saturday night before Mardi Gras on the parade calendar from 1954 until 1964 when it ceased operations. It seemed odd not to have a parade to attend that crisp Saturday evening in 1965. So, as he sat on his porch on DeSaix Boulevard, a young Ed Muniz dreamed of filling the evening with a new parade. His love for Mardi Gras ran deep. He had ridden as a substitute in the 1958 Babylon parade and loved the experience. As a former member of the Krewe of Thoth, (he quit when he couldn't afford their dues and his new bride), Mardi Gras parades were in his blood. Actually, the dream of captaining a krewe started much earlier, when an even younger Muniz constructed a miniature parade in his parents' home in Gentilly. (The front room was the parade's formation area, the next room represented Gallier Hall and the Kitchen was Canal Street.) Later, sitting on the swings at Stallings Playground on Gentilly Boulevard, Muniz watched Public Service trucks pass on their way to the N.O.P.S.I. yard. He fantasized that they were actually leading a parade. One day, he thought, it would be his parade that others would be watching. However, several obstacles almost side tracked the dream. When he was unable to assemble enough members to form a krewe for the 1966 season, Ed thought about joining another new club that was organizing for that year. Stories circulated that the krewe of Pegasus would roll in Muniz's beloved Gentilly, possibly on Saturday night. But when Pegasus announced that its maiden voyage would be held on Tuesday evening, traveling on a different route, Muniz realized that his dream of a Saturday night parade would go unfulfilled-unless, that is, he personally did something about it. Ed's trip to the library to look up a mythological name for his new club finally narrowed down to two choices-Endymion and Bacchus. (Ironically, another group would select the latter name and start a club of their own three years later.) When Ed cashed the winning ticket at the Fairgrounds on a horse named Endymion, however, the choice was made for him. Fate had deemed it-the Gentilly Carnival Club would parade under the title of the Krewe of Endymion. After an organizational meeting with nine other men, Ed pressed ahead for the 1967 season. Slowly-too slowly for Muniz-members started joining the new Krewe of Endymion which had been granted a Saturday night parade permit. With only about 50 members in the fold, a "make-it-or-break-it" meeting was scheduled for May 3, 1966, at the fledgling club's gathering spot, Watkins Catering Service on North Broad and Desoto Streets. Just four hours before the meeting was to begin, Watkins burned to the ground! After an emergency call to Msgr. Edward Prendergast (now deceased), former pastor at St. Rose of Lima Church, the krewe was allowed to meet in the parish hall on Bayou Road and North Broad Street. (It was the first time in the parish's history that a non church- related group was permitted to meet there.) Muniz posted two members outside Watkins Catering Service to direct potential members to the new meeting spot. That eventful evening, 70 members signed-up and the new krewe had begun in earnest. From the start, the Krewe of Carrollton's Captain, John Ackermann, became Endymion's guardian angel. Virtually everything Endymion was created its first year, from the krewe's charter to the format of its printed ball program, was patterned after the Krewe of Carrollton. Ackermann rented Endymion 16 floats for the total sum of $5,000. He also introduced Muniz to Brigadier General Harry Mendelson, Sr., who signed a three-year contract to provide bands for Endymion. After his passing, Musette Mendelson Gonzales, the General's daughter, assumed the job and remains, as the driving force in obtaining the superior bands and marching units that are featured in each Endymion parade. As a former promoter of teenage dances and as a man who made his living selling advertising, Muniz was keenly aware of how to market a product. He decided to invite politicians and media personalities to appear in the parade, knowing that these influential people would be talking about Endymion before and after the event. Muniz did everything he could think of to carry out the new krewe's philosophy, "If it creates conversation and excitement, let's do it!" The weather was a real concern the first weekend in February, 1967. It rained the day before Endymion's first pardae and the day after. But all was clear on parade day, and after the men enjoyed a luncheon at the Vista Shores Country Club, they drove to the Jung Hotel where they dressed and were then bussed to the formation area along Trafalgar Street in Gentilly. As the 6:30 p.m. step-off time neared, the Captain became worried. His flare-carriers had not reported, and the crowds were very thin at the parade's starting point on DeSaix and Trafalgar adjacent to the Fairgrounds. Pre-parade newspaper coverage had been limited to brief mentions in columns by Tommy Griffin, Maud O'Bryan and Pie Dufour, and Muniz worried that rumors claiming Endymion was really just another truck parade or kiddie krewe might have diminished the crowd and killed his parade. The Captain breathed a sigh of relief, however, when a message relayed by a motorcycle policeman'swalkie-talkie revealed that the torch-bearers and the crowds were out in full force. They were waiting for the parade six blocks up the street, at DeSaix Circle-the location incorrectly published as Endymion's starting point! That eventful evening February 4, 1967, with 155 men aboard 16 Carrolton floats, the krewe presented its very first parade, TAKE ME OUT TO THE BALL GAME. Major league teams such as Boston Patriots, the Houston Astros, and the Los Angeles Dodgers were depicted. The final float saluted the New Orleans Saints, a team that had yet to play its first game. The procession featured 68 units, including the famed Olympia Brass Band which preceded the Captain's car. The dukes and officers rode in convertibles and a special car carried gifts for the Milne Girls' Home for Retarded Orphans, then located on the corner of DeSaix Gentilly Boulevards. To help establish an identity, the crew hired high stepping cheerleaders to carry signs that spelled out "E-N-D-Y-M-I-O-N 1-9-6-7." Ridging as guests of the krewe were popular Tulane University football coach, Jim Pittman, and star of the Houston Astros, New Orleans' own, Rusty Staub. Local television and newspaper personalities, Wayne Mack, Buddy Diliberto and Art Burke also rode in the parade. Endymion decided to call its doubloons "tokens of youth" and 100,000 gold anodized coins bearing the likeness of Babe Ruth were tossed. Endymion's inaugural ball was planned as an informal tableau presentation and supper dance where Harry P. Rosenthal, Endymion I, Toasted His Queen, Mrs. Eliska Rosenthal. The event was held in the Hall of the Americas in the Jung Hotel, immediately following the parade. The next morning, the society section of the Times-Picayune, under the banner, "Endymion Krewe Newcomer to Gala," proclaimed " A lusty and beautiful baby was born to the Carnival festivities Saturday night when the Krewe of Endymion presented its first Carnival ball." The dukes of the court saluted gridiron colors of Ole Miss, Georgia Tech, Alabama, LSU, Florida, Notre Dame, Loyola, and Tulane, while the maids portrayed the homecoming courts. The ball was declared a success and apparently so was the parade that preceded it. For early on Sunday morning, Joe Muniz, Ed's father and co-founder of the krewe, called to say that his telephone was ringing off the hook. The whole neighborhood wanted to join Endymion! "Highlights Of The Silver Screen"
"N.O., America’s Most Interesting City"
"Endymion, A Thing of Beauty"
"Come To The Mardi Gras"
"New Orleans, This Is Your Life"
"Saturday Night At The Movies"
"Mardi Gras From The Beginning"
"At Home In The Dome"
"A Space Odyssey- Mankind’s Journey Into Space"
"New Orleans from A to Z"
"Legends & Lure of Gold"